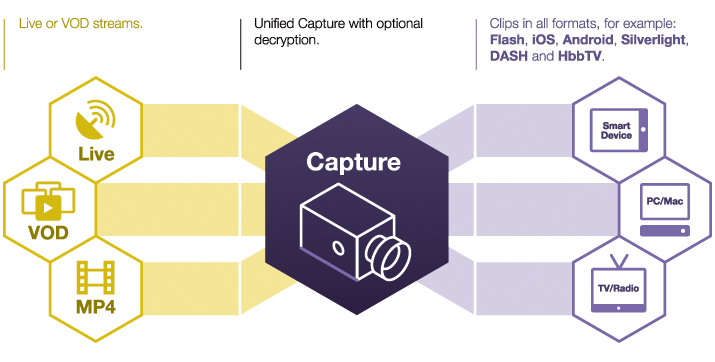 For many companies, especially for broadcasters, there is a common question : how can I de-linearize the live to create VoD contents ? During last IBC, I made a turn of the different tools which can help to create this kind of workflows. Some provides software and others provides appliances. Here is an overview of the different solutions of the company I identified which provide solutions. Harmonic provides some solutions to generate file from live stream : ProMedia Live server, ProStream 1000 with ACE. 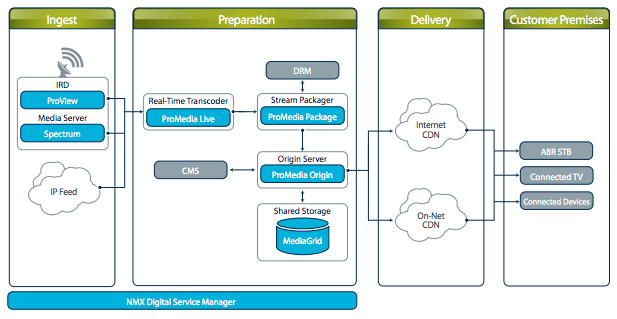 The ProMedia Live can be available as software only or as an appliance (based on optimized hardware). The ProMedia 1000 with ACE is a 1U device. You can use API or GUI to manage the server and create to order to generate VoD content from Live stream. Both support SDI inputs of HD/SD video or MPEG2 / H.264 via transport stream. Advanced Replay records the live stream and can be able to provide more than 72hours of recorded streams. The solution is GoP accurate and take as input : TS, RTMP and also SDI. MediaExcel is based in the US. They provide one solution : Media Excel HERO. This platform can manage , on the same one, Live and VoD. MediaExcel provide also 1U servers. You can scale the platform with the cloud to create a head-end architecture. “With HERO’s on-demand dynamic repurposing for live-to-live, live-to-file, and file-to-file transcoding, no other platform delivers the quality, ease of use, and management capabilities for reducing CAPEX and OPEX.” said John Hotchkiss, COO at Media Excel, during last IBC. manage failover (for example if one input failed, the solution use another). You can have an overview on how to create workflow via the Youtube channel. CodeShop, knew with it main product Unified Streaming, announced last Summer Unified Capture. The solution can be implemented in the Unified Streaming environment. You save your live stream on the disk. Then, you send to Unified Capture (a command-line tool) the TC-in and TC-out to cut and you obtain a single file output. This solution is also frame accurate. This article give an overview of the different solutions I identified, but perhaps I missed others companies/solutions. If yes, don’t hesitate to add a comment in the thread.